We are on the last day of the second week and I am so enjoying reading so many posts on flat breads. 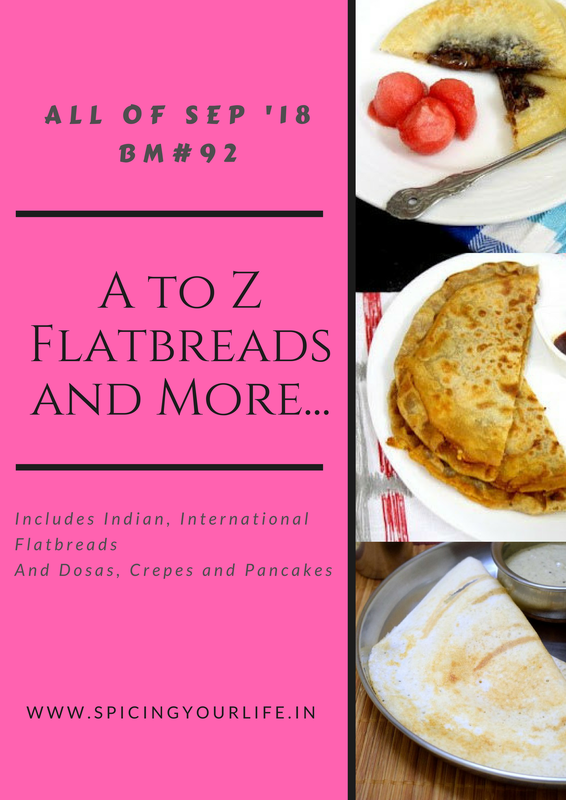 I am not sure how to pronounce the bread for today, but the name was perfect for the alphabet M for my A-Z flat breads theme. And if you combine bread and sesame, it is always a winner. The recipe given was pretty easy to make and a beginner can make it easily. These breads are pan fried and with the sesame seeds they turn out pretty flavourful. The dough uses coconut milk which gives it an awesome rich taste. As I was making the flat breads for Sruti, I kept the side dishes really simple. She likes to eat bread as it is or with butter or jam. She is not much into spicy sides except when it comes to poori. The bread is shaped and then topped with sesame seeds. The pan is greased well and the bread is placed sesame seeds side down on the pan. When it is properly cooked, it gives the bread a nice golden colour and the bread turns out nice and crispy. The dough is easy to work with. With a little bit of oil, you can stretch it into a disc on the counter. You don’t need a rolling pin to do that. Serve it hot out of stove with either butter, cheese or jam or some spicy curry or soup. Whatever the side dish may be, the bread will be so good with them. I used coconut oil for cooking the breads, but you can use ghee, butter or refined oil. In a bowl, mix together flour, salt, instant yeast and mix well. Add coconut milk and knead a soft dough. Add one or two tablespoons of extra milk if the dough is very dry. Knead the dough for 10 minutes, until soft and pliable. Cover and set aside for an hour to double in volume. Divide it into three portions and roll each into a ball. On the counter, apply oil and take one ball. Spread it into a thin disc using your fingers. Add sesame seeds and press them well so that they stick to the dough. Heat a tawa and add some oil in it. Place the rolled out disc, sesame seeds down on the tawa. Cook until the bread is puffy and the bottom is nicely browned. Flip and cook until the other side browns too. Serve it hot with butter, jam or soup or curry. The coconut milk would have lent such a wonderful flavor to the flatbread (I have no idea how to pronounce the name)! I could have it just as is without any accompaniment. Yum!! Yea even i like adding sesame seeds while making flatbreads as they give a nice flavor to the breads. Mkate wa Ufuta sounds like an easy bread to make, and the best part is there is coconut milk in it. Seriously am bookmarking to try this bread. Awesome bread with sesame seeds , looks fantastic and must have tasted super . I am happy with stove top breads and this one is equally good , would love to give it a try soon . I love bread – any kind of bread but especially flatbread. Not having to heat up the oven – the heat in the summer and the expense any time. I will be going through all your bread recipes. Thank you so much. Wow! The flavor of coconut milk is unbeatable. With sesame seeds I am sure this bread was wonderful with so many flavors. amazing look of this bread. Really as soon as I read the bread name I thought the same. Kneading dough with coconut milk seems interesting, but looking at it surely makes me feel to try it. So true some breads were like how to pronounce this, I simply use to tell my DH the one starting with T, or the one we eat like this :P..Bread looks perfectly baked, and yes bread and sesame is surely a winner. Zanzibar is our neighbor and so many dishes between Tanzania and Kenya especially the coastal region are interchanged each claiming it to be theirs. However, am wondering how we missed this delicious coconuty flatbread. Looks so fluffy and I would love to serve it with a coconut based curry. ah even I can’t pronounce the name but I don’t care when the dish is so tempting. I love the toasted sesame and on bread it will be so good. I am sure sruti had enjoyed all these breads. I love the use of coconut milk in the dough. That should have been so flavorful. The coconut milk flavor along with the sesame seeds is so tempting! The bread with sesame seeds no doubt is always a winner. I love the nutty taste of roasted sesame so much. I’m sure This bread must taste delicious with some spicy curry. Just the mention of coconut milk and sesame seed for topping makes it sound so delicious. It looks like a simple yet very flavorful bread.